"HonoPureTM is a versatile, integrative health supplement made with 98% pure Honokiol, extracted from the bark of the Magnolia officianalis tree. HonoPure offers a comprehensive range of health benefits and is recommended by leading integrative health providers. Magnolia bark has been used for centuries in traditional Asian preparations. Research over the last two decades has shown that Honokiol, an important ingredient in Magnolia bark, provides numerous health benefits. 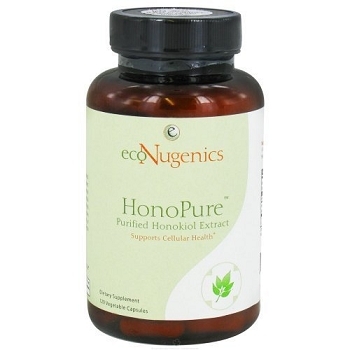 This wide range of beneficial actions combined with the safety of Honokiol is what inspired EcoNugenics’ research team to develop, HonoPure, the highest purity and quality Honokiol available. Research shows that this unique extract provides comprehensive cellular health support in a broad range of areas: breast, prostate, lung, colon, blood and more, without the risk of toxicity. HonoPure protects and supports cells through multiple means of action. HonoPure works synergistically with cellular health botanicals and nutrients, like Pectasol-C, effectively enhancing the cellular health benefits of multiple compounds. HonoPure promotes gentle relaxation and a sense of calm, safely and effectively. HonoPure is a potent free radical scavenger 1,000 times more effective than vitamin E. Research suggests that Honokiol may help decrease oxidative stress throughout the body. HonoPure’s molecules are small enough to be easily absorbed into the blood stream. This makes it readily available throughout the body so it can work quickly and effectively." Sensitive individuals may feel mildly drowsy after taking. If drowsiness occurs, do not drive or operate machinery until you feel alert. This effect may be enhanced by alcohol, sleeping aids or sedatives. Take 2-4 capsules, 1-3 times a day, with food, or as directed by your health care professional. Artichoke Leaf Extract is great for the liver and more. Help from a prehistoric tree. In India, the "Greatest of the Great." For intestinal health and much more.